"A fresh tasting Asian-inspired kabob. Preparation time: 20 minutes. This recipe is from The WEBB Cooks, articles and recipes by Robyn Webb, courtesy of the American Diabetes Association." 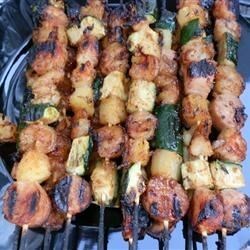 If using wooden skewers, soak 6 of them in warm water for 15 minutes. This prevents the skewers from catching on fire while the kabobs cook. Then thread the shrimp, scallops, peppers, and pineapple on the skewers. Make the basting sauce: In a medium-size mixing bowl, combine rice vinegar, sesame oil, ginger, and soy sauce. Mix well. Prepare an outside grill with an oiled rack set 4 inches above the heat source. Place the skewers on the grill and baste with some of the sauce. Grill kabobs for about 5 to 6 minutes total, turning and basting with the sauce while grilling. Heat remaining basting sauce until warm and serve on the side. if you like shellfish, this is a great, easy, summer recipe. the pineapple and shrimp go wonderfully together. sea scallops (the big ones) are the easiest to use. highly recommended! Was not as flavorful as I had hoped it would be. I have found other marinades for seafood that I preferred. Even my husband really liked these. I used different vegies, but the marinade is great! Sounds good ,but kids wouldn't like it because of the red peppers.